I have been trying to finish this review for weeks! But since the movie is still incredibly successful, it probably won't matter as much. Black Panther is an imperfect movie, really not the masterpiece that some people claim it to be. Just like Wonder Woman was a little revolution for women in the superhero genre, so is Black Panther for African Americans. But that fact alone doesn’t make these movies good. Black Panther has a great villain in Michael B. Jordan’s Killmonger, is great to look at, has many interesting female characters, excellent cinematography and an overall interesting take on the ‘Marvel movie’ concept. But both Spider-Man: Homecoming and Thor: Ragnarok already played with these elements and showed that not all Marvel movies must feel the same. And despite these good things, there are some issues I want to get into now: still relying on African tropes, a some central characters, weak CGI and a couple of plot/character conveniences that felt like cheating. It seems so difficult to separate the event of the sheer existence of this movie – a movie by black people, mostly starring black people, more or less dealing with issues of black people – from the missed opportunities it includes. And to be clear: I know we can’t really expect more from a franchise/Disney movie and maybe we should be glad to even get this much! And who knows, it might pave the way for more in the future. A perfect example is the Public Enemy posters shown in the background in two different scenes. 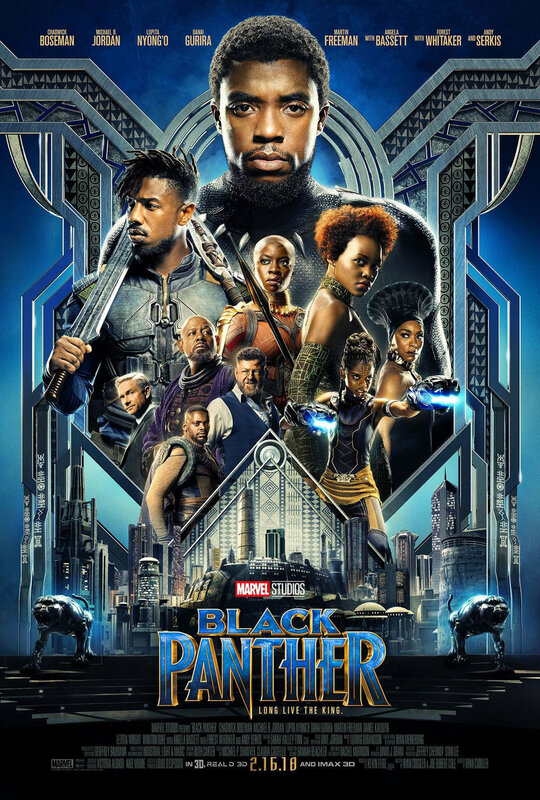 On the one hand, it is awesome to see this radical, political rap group featured in a superhero blockbuster, thereby alluding to their strong message of black power that is basically unique for this and any time. On the other hand, that’s all it is, a silent allusion in the background of two shots. If you don’t know who they are, it won’t mean much, so it’s just mute preaching to the choir. I feel conflicted even writing this. My heart jumped when I saw the poster but in the end I wondered if that really was all there is. There is more. 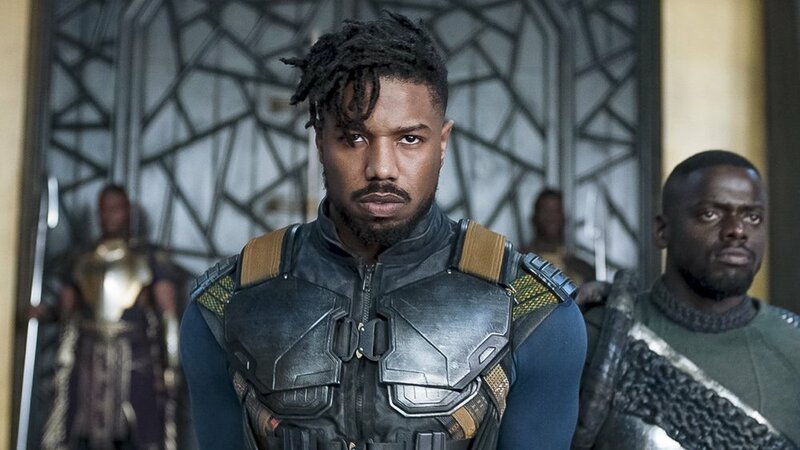 Killmonger (Michael B. Jordan), or N’Jobu, talks about black resistance, the conquerors and the conquered and his final line is the most powerful sentence in the whole movie. That makes him a great character and an interesting villain, but it is unfortunate that he is the only one discussing those issues. It is an old trick to give the most agreeable lines to villains so we don’t have to think about them too much but it means that after he is gone, his issues are gone too. The movie decides to avoid the tough decisions for T’Challa and instead focuses on charity work as the ultimate solution, which seems really problematic for a movie about Africa, where charity has done more harm than good. My biggest problem is the way the movie deals with Africa. Its basic premise (which admittedly it owes to the source material) is that Wakanda is the one African country that surpasses every other country in technology, wealth, society and so on. Not just every other African country, but internationally. Where does this success come from? Why is Wakanda different than how we imagine every other African country, full of starvation, civil war and corruption? How did they manage that? Well, because an alien resource fell from the sky. Which leads to their amazing technology and apparently technology solves everything. The movie could have shown how people in Africa are innovative and successful and city builders and diverse. Instead, success is shown to be an exception, basically a miracle. The city of Wakanda (is there a difference between the country and the capital? And how do they keep a seemingly ever-growing population confined to that space?) is impressive and great but it is a fantasy. The only thing we see of the real Africa is exotic animals and nature and Nigerian military. Which makes it clear that the rest of Africa is still identical to the image in our head, nation with armed conflicts and misery that need outside help. When you see the great city of Wakanda, your heart might feel joy but how much better would it have been to show an actual African metropolis and not an illusionary utopia that just makes us think that this could never happen in real life? The idea to have the different tribes of Wakanda be inspired by real African tribes is interesting but the only effect it has it to make all those different cultures seem interchangeable and random. It makes no sense that they all belong together. The great thing about tribalism is that each tribe can be whatever it wants to be while Wakanda seems to include any culture available. It also reinforces the idea Africaness exist, that this one continent stands above individual tribes, cultures or countries. This is also true for the movie’s score, which bring every typical “African” element in because that is what we expect from a movie set in Africa, the drums, the chants and so on. The movie follows so many Africa tropes that it becomes disheartening. I’m somewhat shocked myself that a movie I had really anticipated felt like something of a letdown and seems getting hollower the more I think about it. At the same time, its general appreciation is just increasing and its success is breaking more and more records. And that is how I torn I feel. I appreciate its existence, its intentions and many of its elements (the politics, the feminism, the all-black-blockbusterness), but I can’t get over all its shortcomings that in some aspects undercuts its strengths. I hope its success enables more movies like this but I also hope that they are more progressive in their ideas.